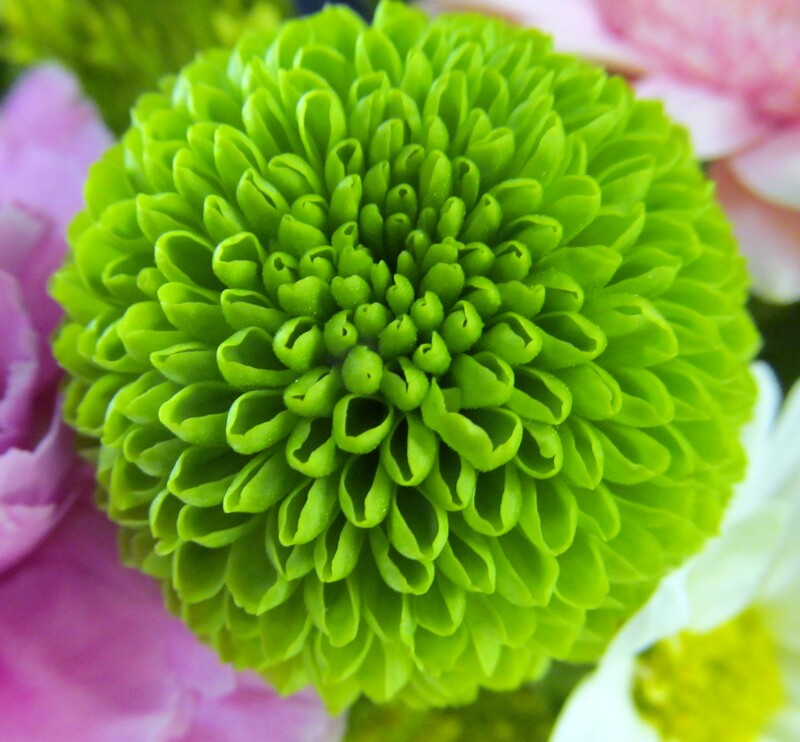 Button Mums are available in yellow, white and lime green. 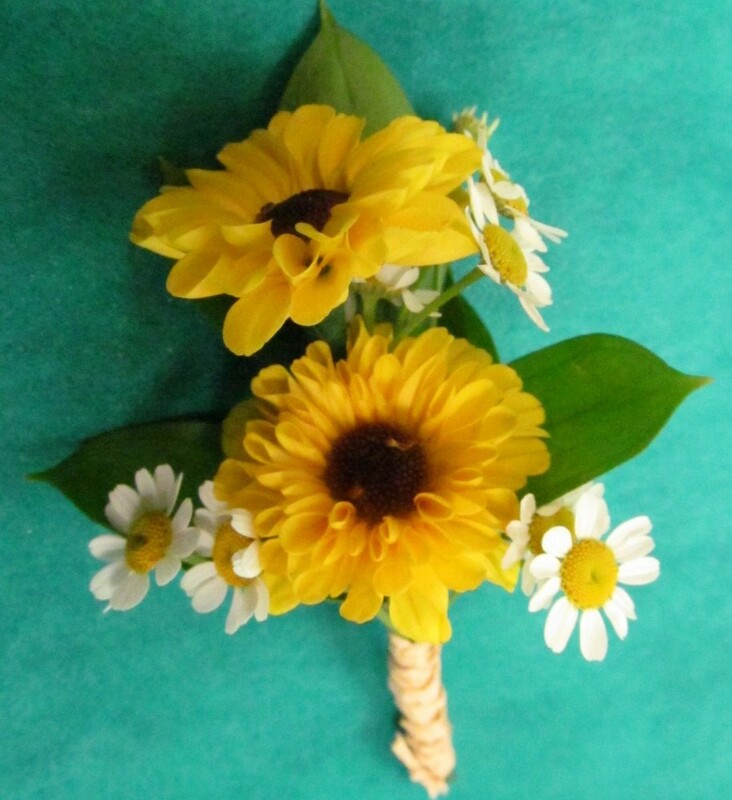 They are an adorable accent flower for bridal bouquets. 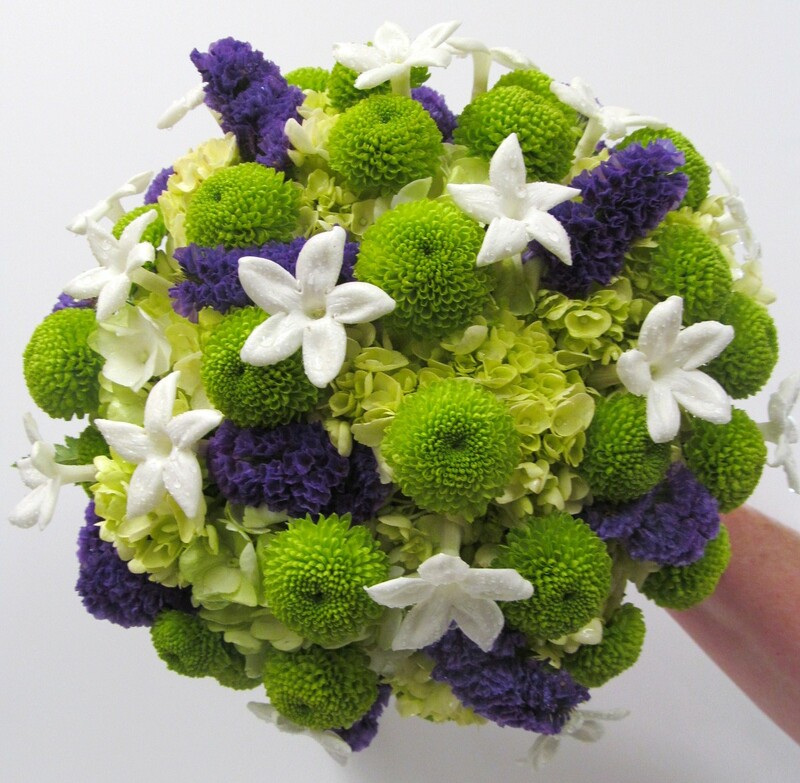 Green button mums complement the purple and white flowers nicely in the bouquet shown above. Cushion Mums are lush and have many petals giving them a look similar to a dahlia. 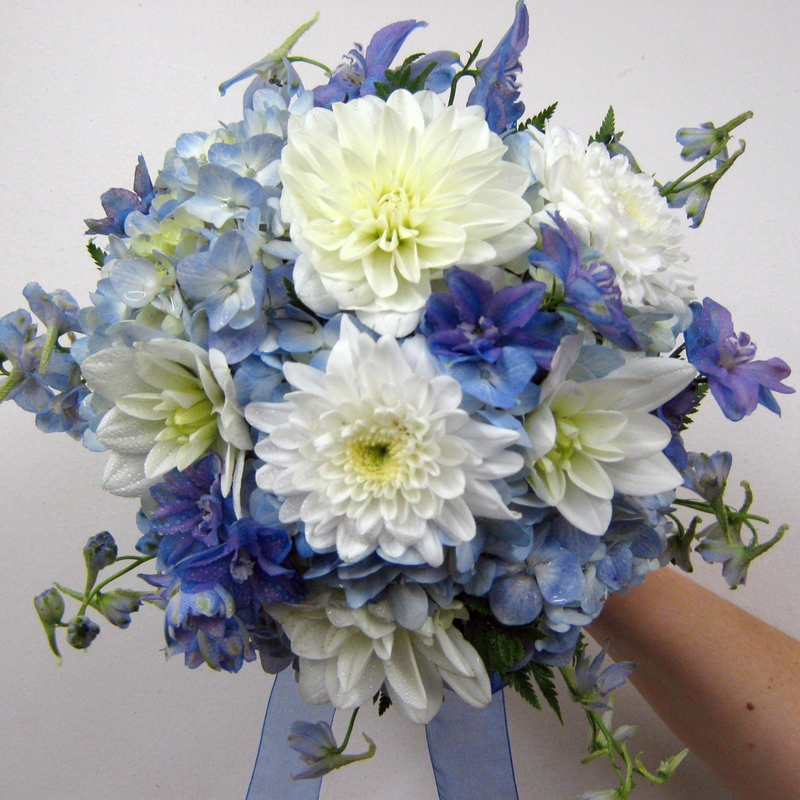 The bouquet shown above has a mix of cushion mums, dahlias, hydrangea and delphinium. They are a mid-sized blossom available in white, yellow, lavender and fall colors. 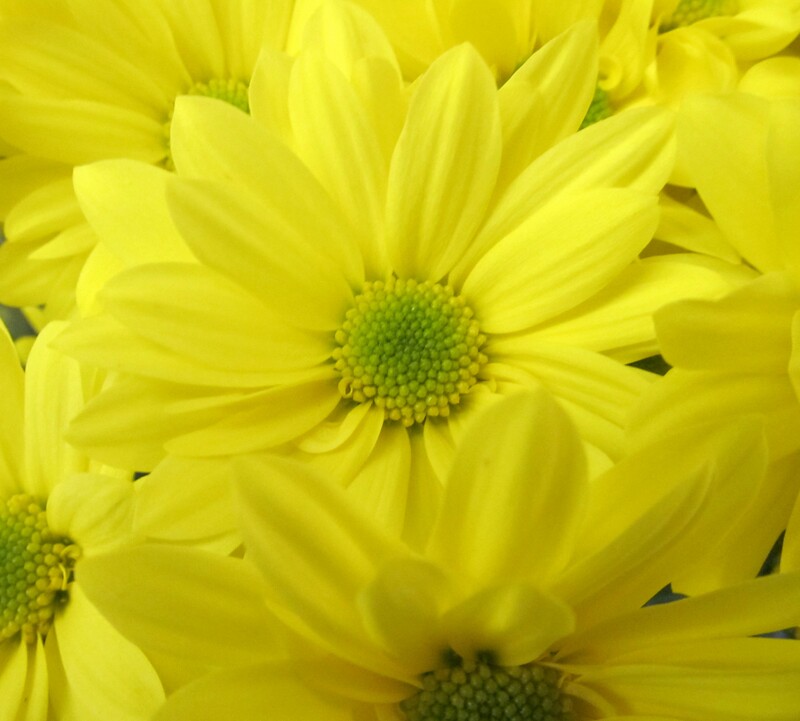 Daisy Mums are one of the most popular forms of both daisies and mums. Loved for being one of the longest lasting flowers, daisies are available in a wide variety of colors such as white, yellow, lavender, plum, rust and burgundy. 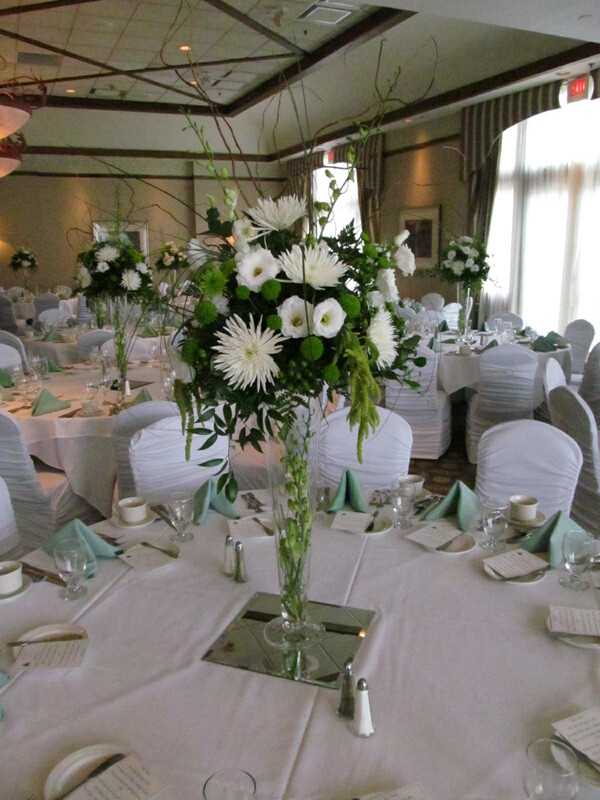 White daisy mums shown are casual and chic in the centerpieces shown for a brunch event. Viking mums look like miniature sunflowers. They look wonderful in summer and fall weddings. They are a perfect accent flower for corsages, bouquets or in a flower girl ball. Fuji Mums are a large spikey variety of mum available in lime green, white, lavender and yellow. 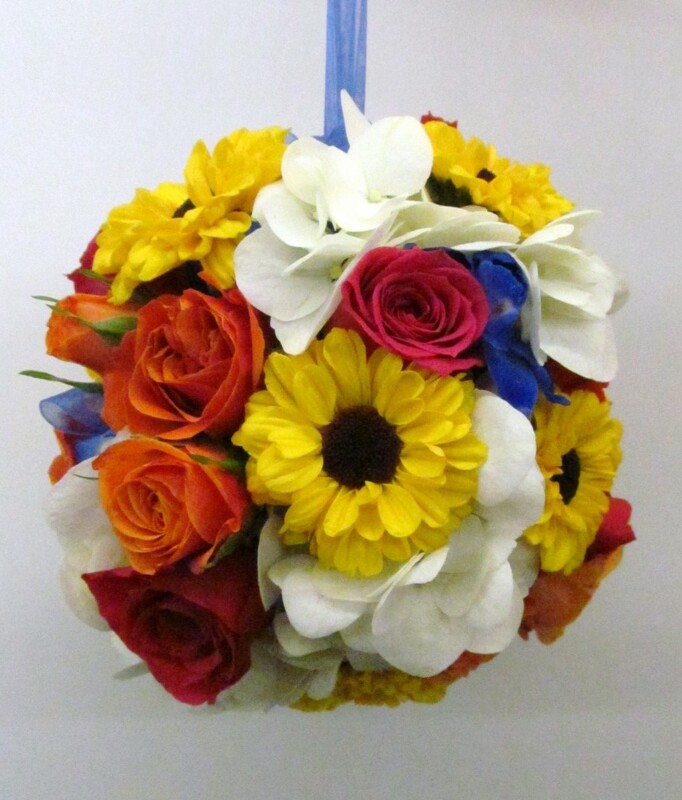 They are a wonderful focal flower for centerpieces or ceremony and reception décor. 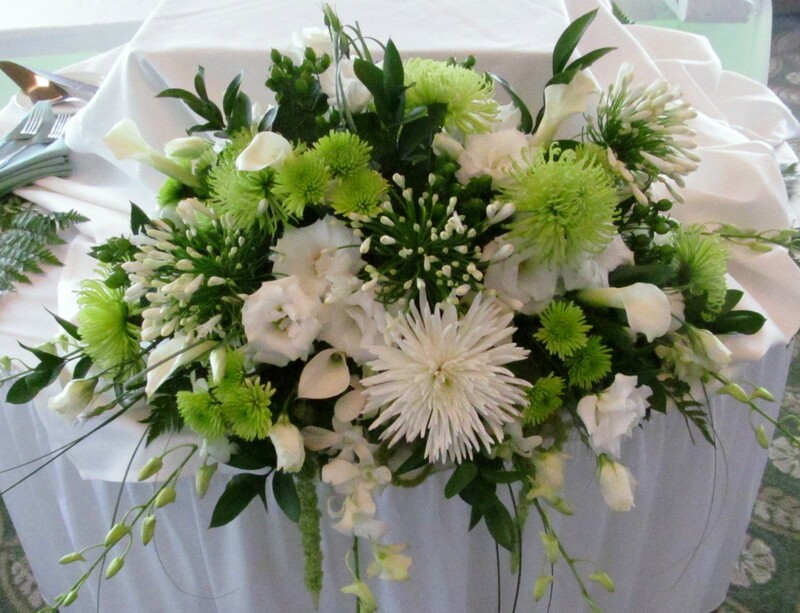 Both green and white fuji mums along with smaller green mums are used in reception flowers for a wedding at Westwood Country Club in Amherst, NY. 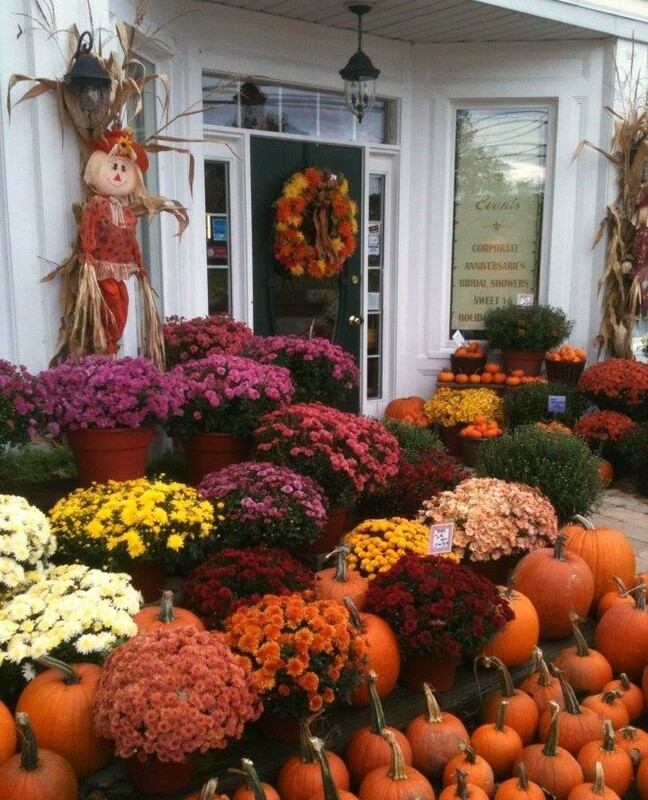 Mum Plants are commonly used for fall decorating and can be seen all over this time of year. 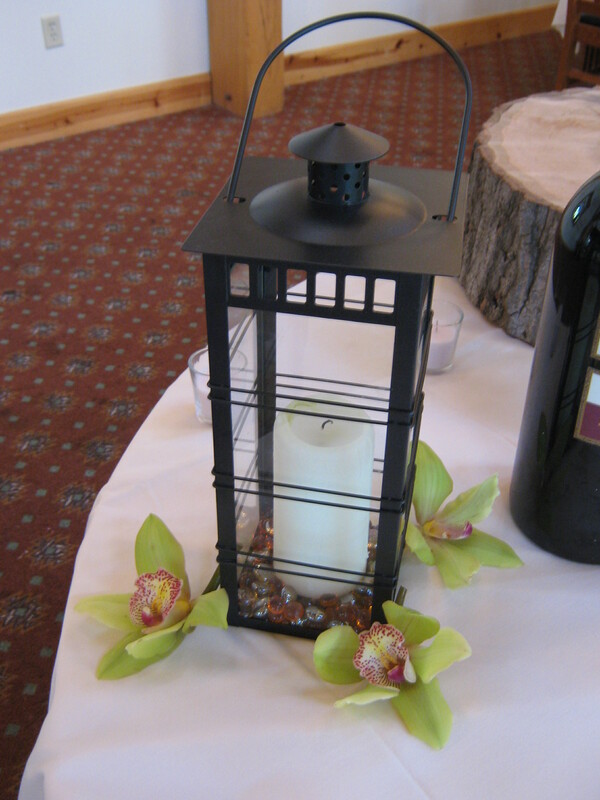 However, they are also a great cost effective accent for a late summer or fall wedding ceremony. 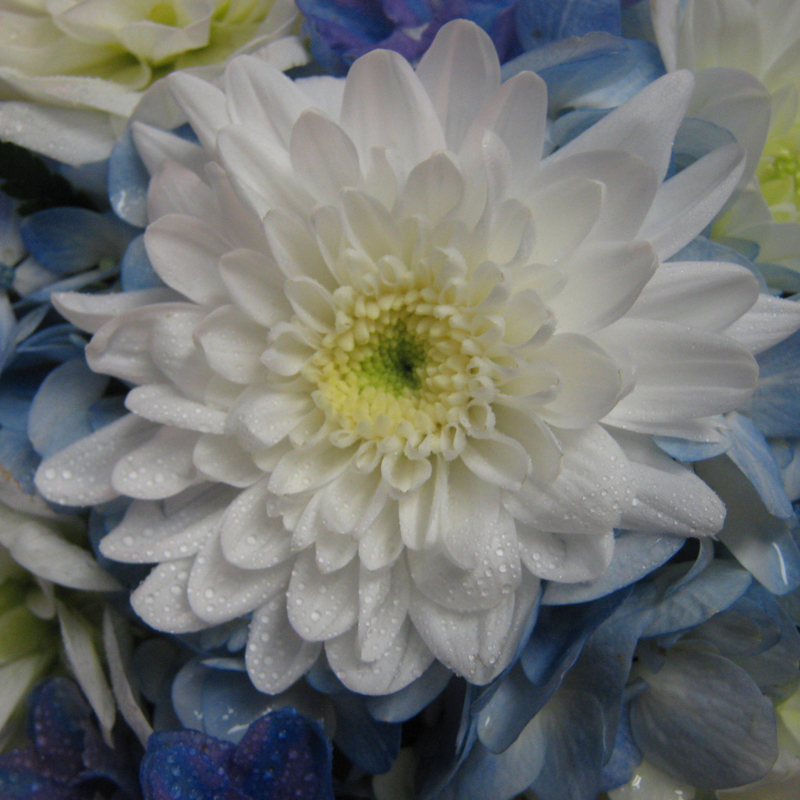 Lipinoga Florist offers many different colors of mum plants to complement your wedding décor. 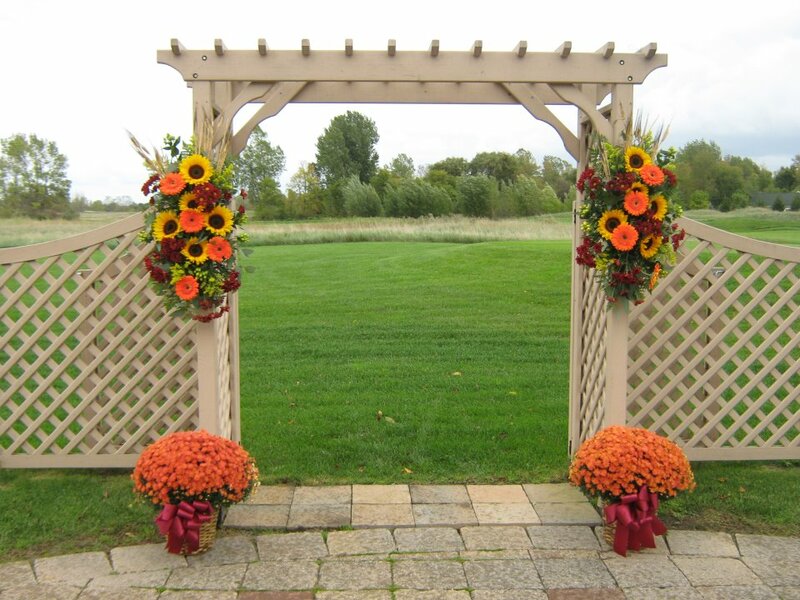 Two mum plants complete an autumn look for a wedding held at the Timberlodge in Akron, NY. 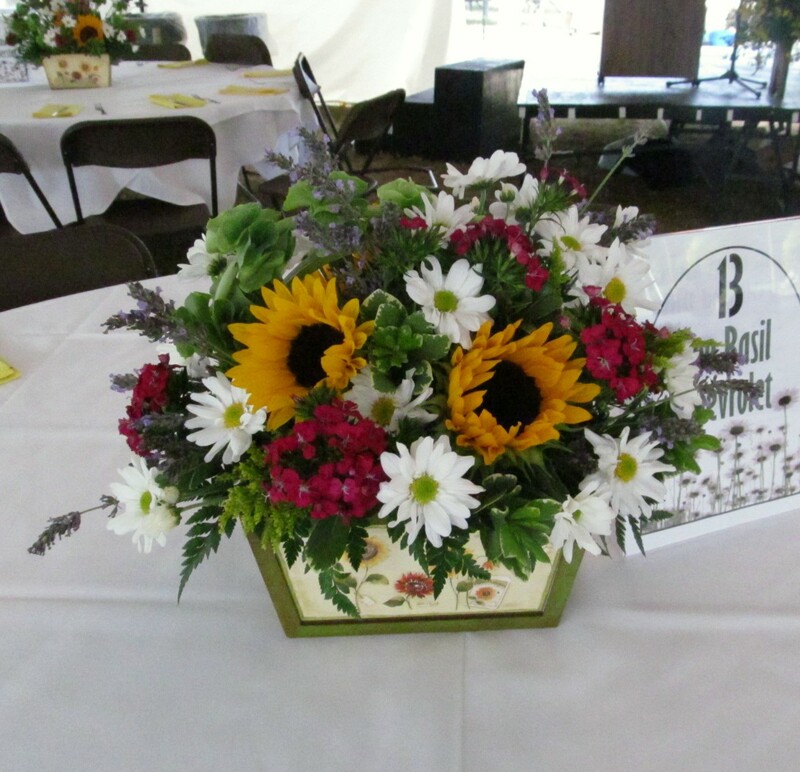 Two arrangements of flowers including some daisy mums, sunflowers and gerbera daisies create a beautiful setting for an outdoor wedding. 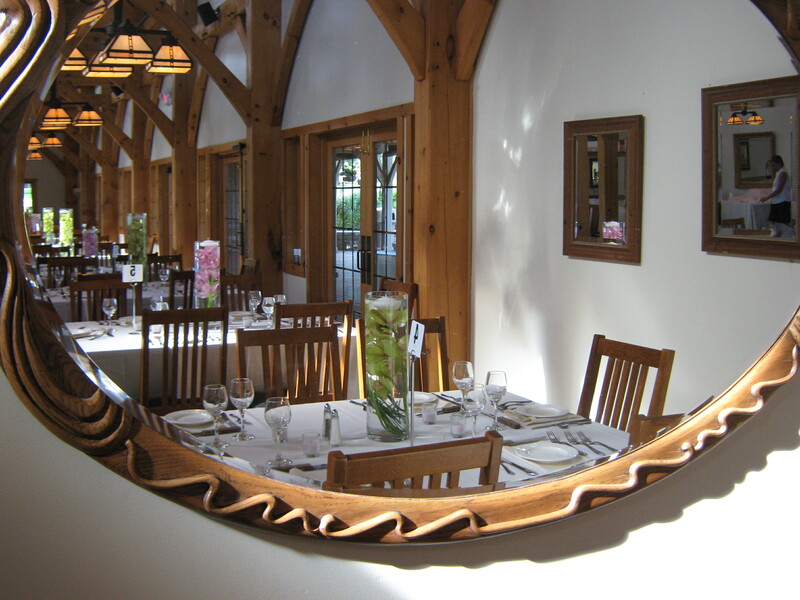 The Timberlodge, located at Arrowhead Golf Course in Akron, NY is a unique location to be married. It features rustic touches and breathtaking views. Ceremonies are held on an outdoor patio overlooking the golf course. A beautiful arrangement of purple and green flowers accents the top of the arch where the bride & groom are to be married. 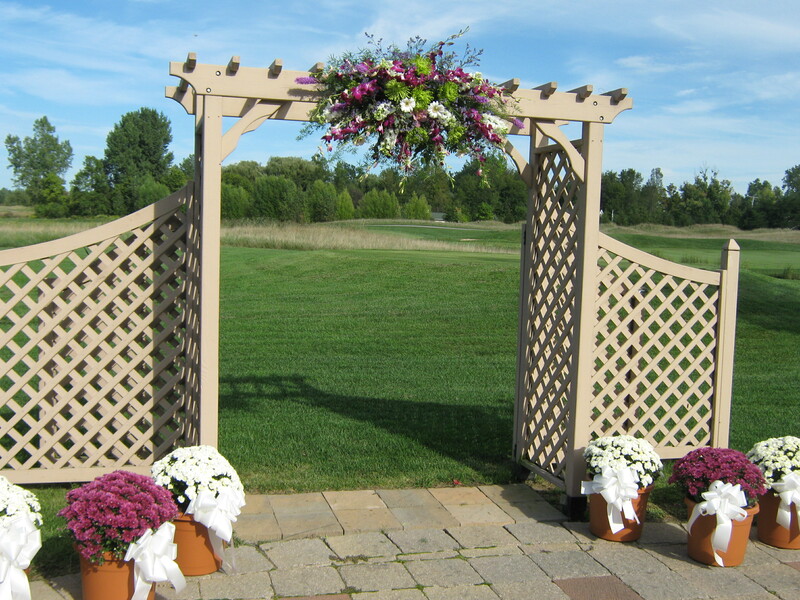 Mum plants enhance the breathtaking scenery and create an ambiance where the ceremony is to be held. 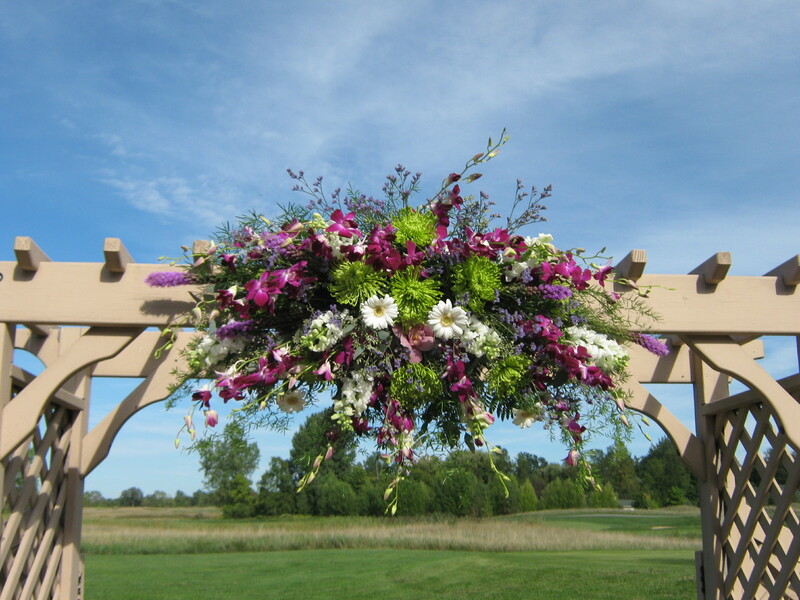 Orchids, Mums, and other assorted wildflowers in purples and greens add a personal touch to the ceremony arch. Baskets of rose petals will be held by ushers so guests may take a handful to toss onto the bride and groom as they exit the ceremony area. 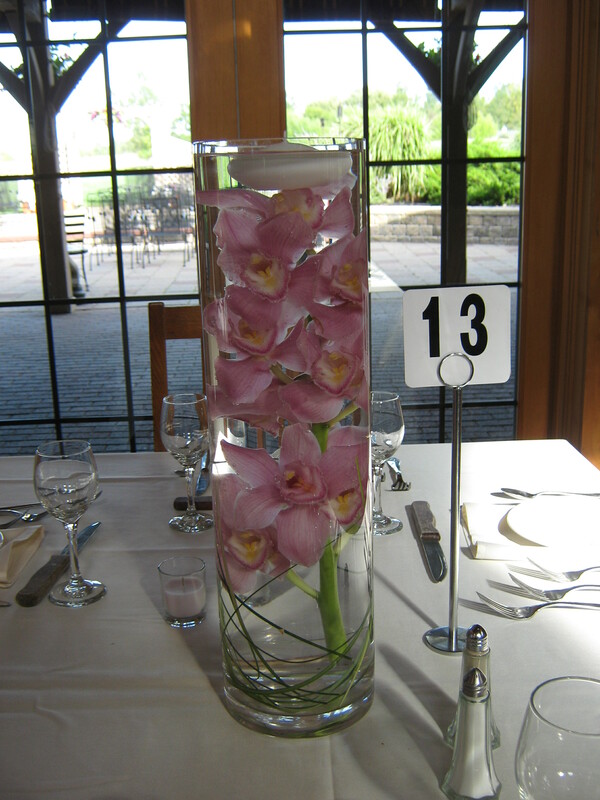 Simple centerpieces of orchids submerged in cylinders are accented by floating candles. A modern yet elegant choice, we offer these cylinder containers for rental. 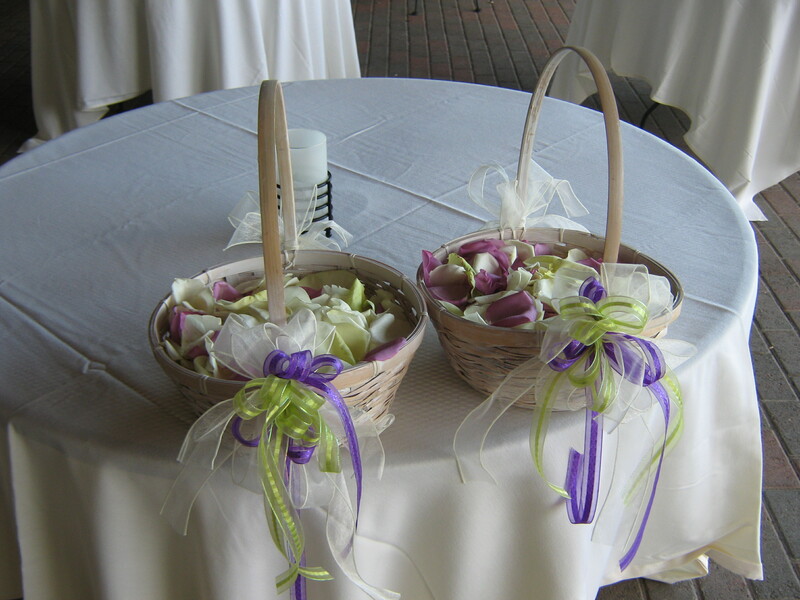 Our designers carefully assemble the centerpieces and deliver them to your reception for a hassle-free wedding day. 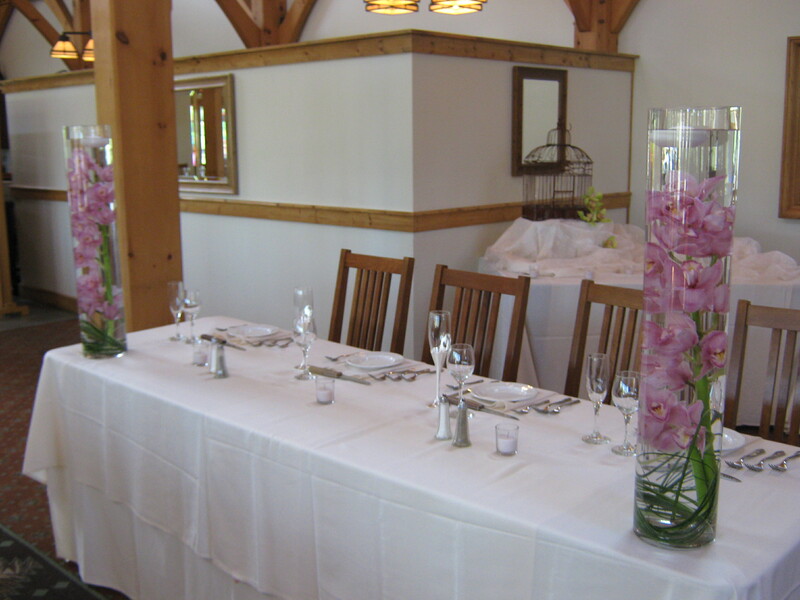 Two larger cylinders of lavender orchids, accent the ends of the head table. Our designers pay attention to every detail on your wedding day. 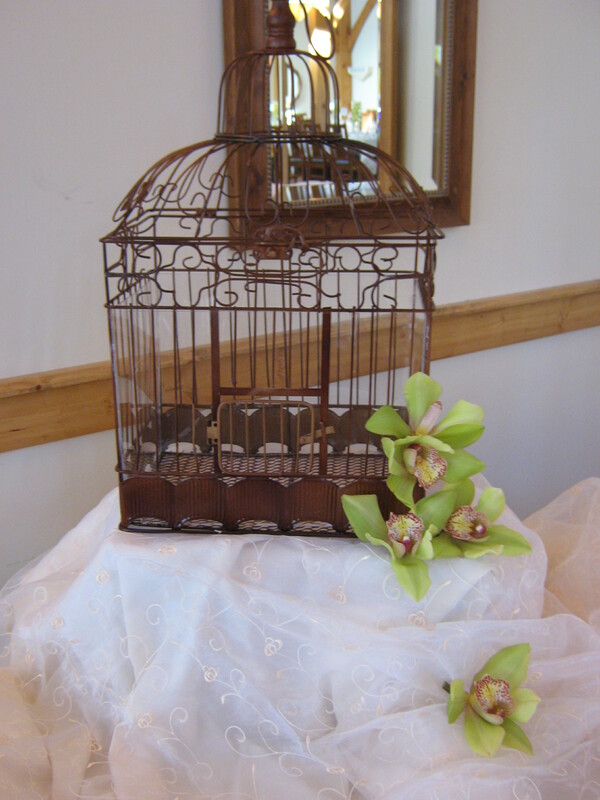 Small floral touches such as orchids accenting a birdcage for cards and as an accent to lanterns on accent tables, make your wedding day more special and follow through with your overall look and theme.